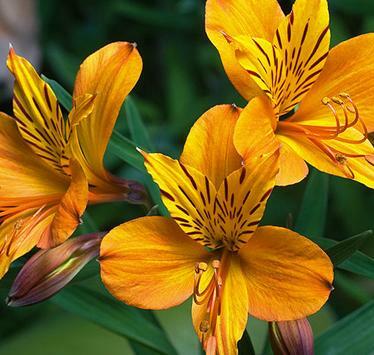 Alstroemeria are often called Peruvian or Parrot Lily and belongs to genus of about fifty species. As its name implies, it originates from regions of the Andes in South America. Most hybrid cultivars are laboratory propagated by meristem culture and have a range of markings and colours from white to yellow, orange, pink, red, lavender and purple. They are a challenging plant to grow but as a cut flower in water, they can last two weeks or more. Some of the varieties can become invasive. 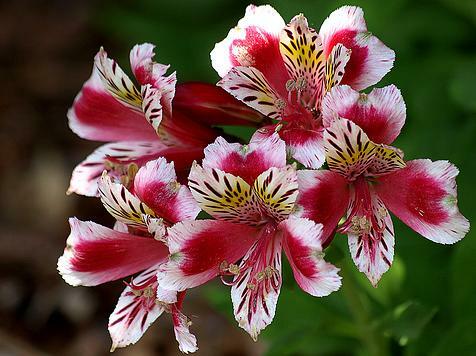 Alstroemeria grow from tuberous roots. Plant in late spring, when there is no danger of frost. They can also be started in the greenhouse or in a warm window. Planting in autumn will not give the plants enough time to establish before frosts. Choose a planting site in full sun and sheltered from the wind. The soil should be well drained and enriched with compost. Tall varieties grow 60-90 cm and need staking. The modern varieties are not invasive, the stool increasing in size only slightly each year. Space each new plant 60cm apart. Dig the soil well and plant 5cm below the surface, firm and water well. Mulching will help retain moisture and keep the rhizome cool in the summer. Flowers are not produced if the roots are overheated. Feed with a general fertiliser each spring. Cut back the old growth to ground level in November and cover with 5-10cm of compost or mulch as an insulation. In cool climates, they can be grown in the greenhouse. Soil treatment is the same, though shading should be used to avoid too high soil temperatures. Remove the stems that do not flower. Propagate by seed or division. Alstroemeria are susceptible to aphids, other sucking insects and slugs. Plant in a sunny, sheltered position in well cultivated, composted soil.